Welcome to an exciting and challenging year! Fourth grade is an important time in your child’s development. Students begin to learn how to prepare for tests and quizzes, and they will be instructed in some important strategies for taking tests. We lay the groundwork for your child’s middle school years. Fourth grade is a transitional year between the primary and middle school years; so many exciting things begin to happen! This is the first year students are evaluated using letter grades. Responsibility increases, and the students continue to acquire a love for reading and writing. Most importantly, our students are supported and nurtured as they struggle to grow throughout the year. We want to help them become the wonderful, capable people God created them to be. 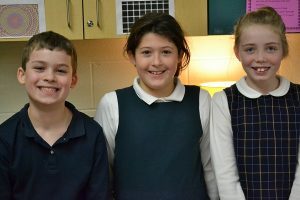 The religion education program for fourth grade centers around the Ten Commandments. We use Christ Our Life the New Evangelization edition. Students do an in-depth study of each commandment. They read, write, listen and illustrate ways the commandments apply to their lives. We also study the Corporal and Spiritual Works of Mercy, the Beatitudes the Virtues, the Gifts of the Holy Spirit and the basic structure of the Bible. To complete the year, the Benziger Family Life series is used to supplement the religion program. Valuing family and respect for self is emphasized. An introduction to how life begins is also covered. Students have opportunities to participate in the weekly Masses. They compose prayers and are expected to memorize the Act of Contrition and The Apostle’s Creed. We show Jesus that we love and respect the awesome gift of His true presence in the Eucharist as we participate in Eucharistic Adoration once a week. Our fourth-grade curriculum is two-fold. We study both grammar and writing throughout the year. The grammar portion consists of a study of sentences, nouns, verbs, adjectives, adverbs, capitalization, and punctuation. In writing, we will use our textbook, Write Source, to guide us through composing perfect paragraphs in all the different modes of writing. We learn to respond to literature. We write descriptive pieces, narrative pieces, persuasive pieces, expository pieces and various forms of poetry. We focus on the six traits of writing which are ideas, word choice, voice, organization, sentence fluency and conventions. We learn how to use a rubric to evaluate writing too! During all of this, we continue to reinforce the writing process and hopefully have some fun!!! In reading we have a novel-based approach. Students learn to outline a novel using the Project Read model. We do various comprehension, fluency and vocabulary activities. We also supplement our program with Accelerated Reader. Zaner-Bloser spelling books are used in class. There is a pretest given each week and a final test given on Friday. The unit pages are introduced every Friday for the upcoming week; students are expected to complete the work independently during that week. Units are due and corrected on Thursday. Challenge words are assigned each week and are curriculum-based. For vocabulary, every five weeks, students will do two units in the Sadlier Vocabulary Workshop books. They will be asked to learn definitions and will be tested on them. The cursive alphabet is reviewed at the beginning of fourth grade. Zaner-Bloser books are used. We reinforce letter formation, strokes, slant and spacing all year. There is an expectation that the students will use good handwriting in all their work. Students will learn how to use a compass, map key and scale. They will also learn about longitude and latitude and their relevance to specific places in the world. The fourth grade has a Classroom Economy. Students apply for jobs, are paid weekly and can use their money in the class store. They will pay taxes monthly and will be asked to purchase tickets as we travel across the U.S.A. Some of the concepts covered are: producer, consumer, supply , demand, opportunity cost and free enterprise. Our math curriculum follows McGraw-Hill’s My Math. This program comes with a wide variety of resources that can be found online at connected.mcgraw-hill.com. Just select our textbook and you will find personal tutors, games and extra help with every lesson that will be taught this year. Our Math program takes a problem-solving approach to mathematics. The problems are often set in the context of everyday situations and offer frequent opportunities to use appropriate mathematical language. Basic skills, such as multiplication facts, are practiced each day as we investigate a variety of algebra-based problems. St. Francis School provides an individualized curriculum two times a week through ALEK. The science curriculum in the fourth grade covers life, earth, and physical science. The textbook we use to teach science is the Macmillan/McGraw-Hill, Science. We start our year out with our life science unit. This unit of study incorporates classifying living things in both the plant and animal kingdoms. Throughout the year, we have weekly labs in our sophisticated science lab where students have an opportunity to conduct hands-on experiments that directly apply to their current unit of study. In addition, each year, students are taught the scientific method and how to properly set up a Science Fair project. Fourth graders will be guided through this process in order to ensure success. Each year a 4th grade musical is produced. Every student has a role, a costume, sings, and has at least one line. Additionally most sing solos and dance. The musical is performed in the spring as part of our Mary Lou Daby Fine Arts Festival. Grades three through five are dedicated to the development of a variety of manipulative skills that reflect a refined mastery of ball handling skills, as well as refined development of a variety of perceptual motor skills. The teaching at this level will focus on the value of being physically fit and the ability to display appropriate behavior during social situations. Students continue to work on their keyboarding skills. They create classroom presentations using multimedia software such as Hyperstudio and Microsoft PowerPoint to incorporate sounds, graphics and animations. Search engines are introduced to students and web browsing is monitored. Students are also introduced to web page design and school projects are posted. Students utilize Microsoft Word to type reports and papers and they are introduced to simple editing functions such as cut, copy, paste and spell check. Grades three through five will also become acquainted with the Spanish language through cross-cultural explorations, as well as interactive and fun activities that include music, stories, projects, skits and games. The vocabulary will increase in order to achieve a higher level of comprehension and conversation. Grammatical concepts are introduced and practiced through conversation and fun activities and games. Beginning reading and writing continues with more emphasis at this time. Hispanic Catholic faith and culture is presented with short prayers, songs and traditions. Learning about different countries and cultures of Latin America and Spain is part of the Spanish program. Fourth-Grade Play: Try-outs and rehearsals are held in February for the fourth-grade musical performed in May at the Mary Lou Daby Spring Arts Festival. Students learn basic acting and blocking skills. This is an exciting four-month project. Field Trips: Various field trips throughout the year complement our social studies, science and language arts curriculum. Many children find the transition to fourth grade challenging. Here are some tips to help you prepare. When you’re a fourth grader, here are some survival tips to ensure your success.